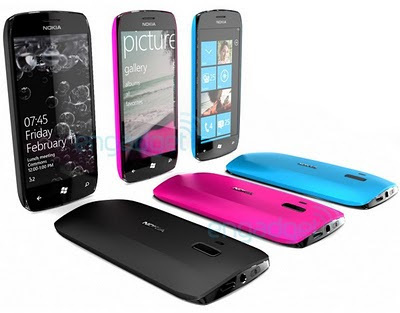 Nokia x Windows Phone 7 concept revealed! Danny Cheng: "Nokia drops the most biggest OS in sales and go with the most smallest OS? but I think this smartphone look nice tho, we'll see, Nokia :)"
DNC: "This is the first image you'll see anywhere of the early fruit of Microsoft and Nokia's budding new partnership. We have it on good authority that the technicolor phones on show are conceptual devices produced by the two companies. You shouldn't, therefore, go jumping to conclusions about retai...l hardware just yet, but hearts should be warmed by the familiarity of Nokia's new design -- the shape of these handsets is somewhere between its recent N8 and C7 Symbian devices and there is, as usual for Nokia, a choice of sprightly colors. The trio of keys adorning the new concept's bottom give away its Windows Phone 7 ties, but also remind us that the N8 and E7 are highly unlikely to receive any WP7 upgrade love. The best part about this whole discovery, however, might be that it confirms Steve Ballmer's assertion that the engineers of both companies have "spent a lot of time on this already."